It’s like an old family photo album this far back on our blog! This post first came out way back in 2011. Sending emails used to be hard but with the Mailgun Email Sending API we moved beyond SMTP and MIME and made it a trivial, dare I say, pleasant experience. Transport issues. The incoming messages need to reach your app somehow. This means there needs to be an MX record somewhere which points to a mail server, capable of forwarding incoming mail into your code. There are many gotchas here. One of them is that you probably want to generate a proper “invalid mailbox” bounces to notify senders if they made a typo in the address. Spam handling issues. Once you start accepting mail for a given MX domain, you must realize that eventually most of the incoming email will be spam. And even if your mail acceptance policy is whitelist-based, having your app deal with spam attacks is not always desirable. MIME parsing issues. We have talked about this before, but parsing MIME is a painful exercise in most programming languages. MIME parsing libraries are not numerous and many of them suffer from poor tolerance to real world traffic. Message Content. Your problems with parsing go well beyond MIME. Most incoming emails are usually replies to messages sent earlier and you usually want to remove the giant quoted parts. Oftentimes, extracting a person’s signature from a message body is desired, as well. The idea behind these code examples is similar to the routing mechanism featured in modern MVC frameworks but instead of matching URLs to controller actions, we want to define routes that mach a recipient address pattern to a function in your code. But how do you go about implementing email_in() given the difficulties listed above? 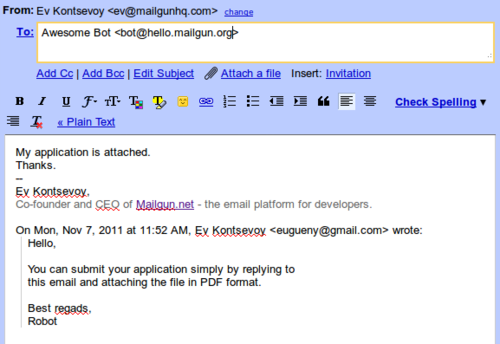 Mailgun Routes to the rescue! We designed them specifically with this use case in mind and they are, by far, the most pleasant way to build a two-way email messaging app. Trust us, we are email doctors! 🙂 But enough talking, lets do something. It will parse the message and POST it into the URL “/emailin” of your app. Lets send a test message using Gmail to our web app and see what is posted. # missing here it only means they were absent from the message. Lets review. What do we have here? Incoming email traffic is matched against a regular expression applied to a message recipient. Matching messages are parsed, checked for spam and HTTP POSTed into the URL of your application. Quoted parts of the message are separated (stripped), signature is detected. If your application is down and not responding, messages will be queued and subsequent delivery attempts will be made for up to 3 days. Additionally, matched messages can be optionally stored in a mailbox for archival, backup or debugging purposes. None of the complexities matter to you anymore. You’re busy writing sweet profit-making code. And by the way, manipulating email routes can be done programmatically via an API. This allows you to build a magical Flask/Sinatra-like @email_in() decorator which would bind everything together. Mailgun routes can do more than a simple recipient address matching. They support regular expression captures, match-if-nothing-else matched behavior, they have priority of execution, they’re basically a simple mail routing programming language. There you have it. Pure awesomeness. Now lets get busy and rid the world of dumb “no-reply@” emails. It’s about time.